An excellent, quick and efficient method of insulating and air sealing commercial buildings. Spray foam insulation strengthens, insulates and weatherproofs your roof. Insulation is one of the most effective ways to solve condensation problems as it helps balance the air flow and moisture particle levels within a building. Our spray foam is the best method to seal around trouble spots such as vents, up-stands and drainage outlets etc. 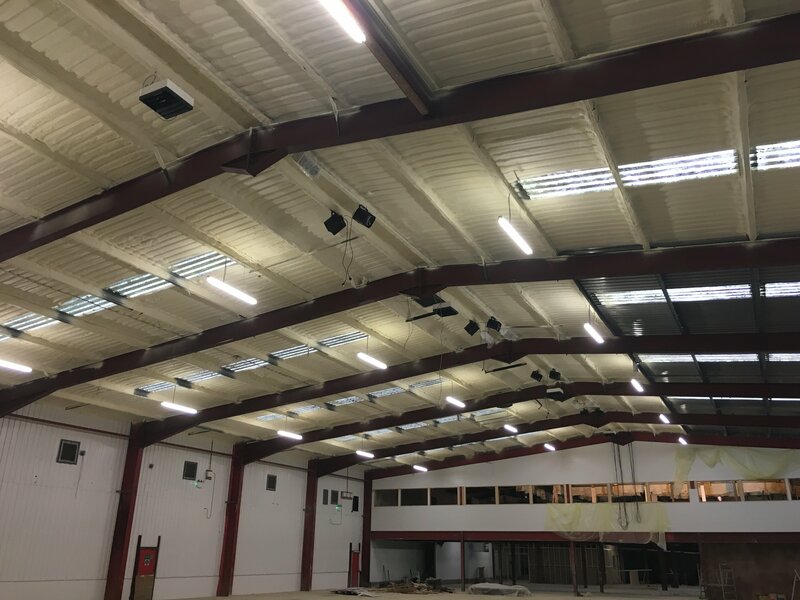 Green Insulation UK combats the problem of little or no metal roof insulation in industrial and commercial buildings by making the workplace more comfortable, safe and reduced heating costs with our open cell spray foam insulation. 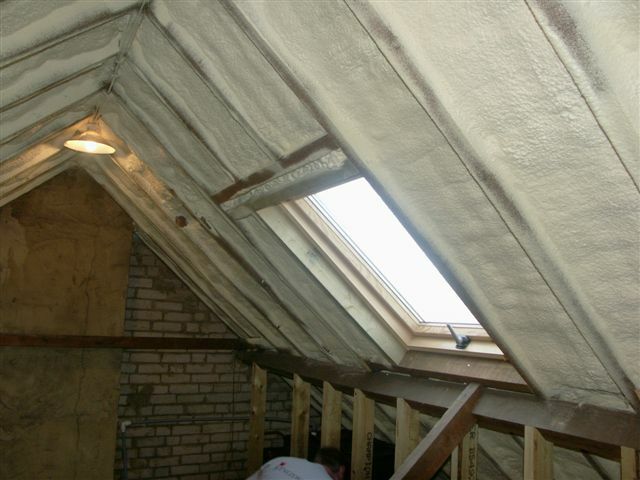 Are you looking to renovate and insulate your roof? Then we can help as we offer full home roof insulation and restoration services. Our roof spray insulation system not only stabilises and weather proofs the roof of your property, it also helps to dramatically reduce your home heating costs. Sprayed polyurethane foam (SPF) is an excellent, quick and efficient method of insulating and air sealing commercial buildings. Not only does it cut heat loss by 90%, it also prevents the build up of condensation. Spray foam insulation stabilises, weather proofs the roof of your property and also helps to dramatically reduce your home heating costs. A layer of our sprayed foam to the underside of a cement asbestos roof will encapsulate the area and prevent fibres from becoming airborne. Underground car parks can be a problem because cold penetrates the concrete soffit and causes a cold environment in properties above. Sprayed foam insulation is ideal for curing this problem. Shipping containers are often used for storage, but the problem is that because they are made from steel they are subject to the formation of condensation. A layer of our spray insulation will eradicate surface condensation. Where the roof is leaking badly or the logistics of spraying internally are too difficult we can apply the foam externally. This will seal all the joints and cracks and give a monolithic, seamless flashing to the roof. Very impressed! Green Insulation are efficient. Job very well done, Excellent workmen! Thanks for a clean & tidy job, Excellent. We were grateful for care and expertise of your team. Thank you. Work was carried out to a very satisfactory standard. The workmen were great and very considerate. Would definitely recommend. Just thought I would let you know your fitters have been and completed the job at Crawford Road. As I didn’t make any comments on the job completion form, I thought I would just tell you how pleased I am with the work. They were polite and friendly, got on with the job without making any mess and tidied up afterwards. I would recommend to Green Insulation to others. Fantastic job by your crew. They were very quick & extremely clean job. I am confident that this will give our roof another 80 years! Whatever you are paying the guys, its not enough, they were marvellous! They worked their socks off. Underground car parks can be a problem because cold penetrates the concrete soffit and causes a cold environment in properties above. Sprayed foam insulation is ideal for curing this problem as the spray insulation strengthens, insulates and weatherproofs your roof.